Pixlr Express is an Android app that allows you to add filters to your photos, it also has tools to edit, add frames, etc.. yOU can apply 600 different effects and it is an interesting alternative to Instagram. This application, one of the best known effects applications and considered by many to be the best at present. Is that Pixlr Express is an editor that will allow us to carry out a series of other actions on our photos in a professional way, not only focused on fun and entertainment. Pixlr Express has three characteristics ,already known: that of adding effects , where we have six different, the lighting, we can add flowers and plants frills produced by light entering the objective, with up to 19 different options, and the edge, where we can choose a frame that surrounds our photography. Also, within each of these options, we have the possibility of setting or modifying the tool. However, what sets Express Pixlr Pixlr-o-matic is that it has adjustment options, which can eliminate defects photography as red eye, lighten certain areas like having a brush, crop or rotate the image, make color settings, focus, etc.. A total of up to 13 tools for us to leave our image list using only our Android smartphone. 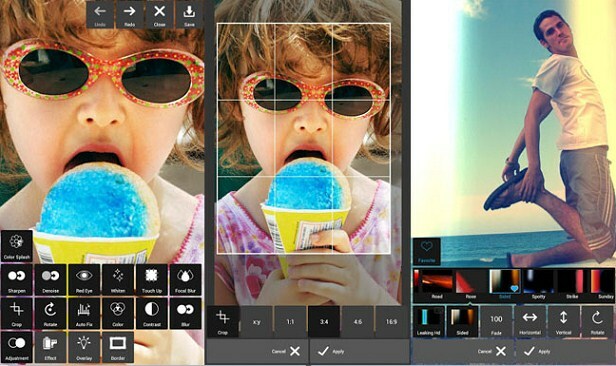 Pixlr Express is available in the Google App Store completely free of charge . What are you waiting for download?